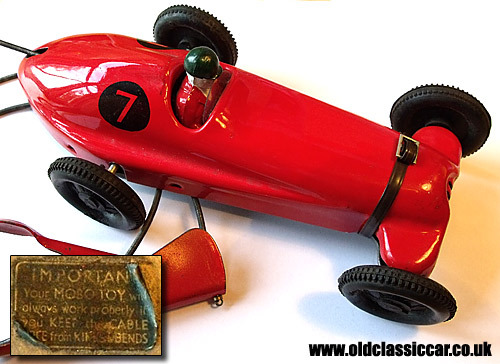 A tinplate Mobo Toy racing car. A Mobo Toy tin plate racing car. 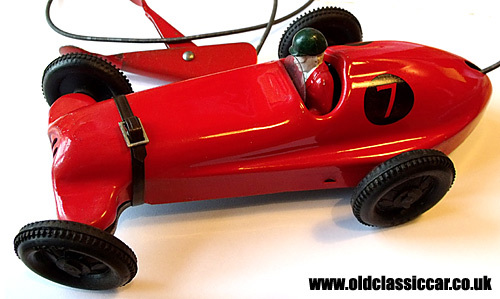 A remote-control Mobo race car from the 1950s. Quite how this old toy survived so well is anyone's guess. Made by Mobo Toys in the 1950s, it features a remote control handgrip and is metal throughout, bar the driver, bonnet strap and the rubber wheels & tyres. The handset incorporates a spring-loaded lever that, when actuated, powers the motor within the racing car itself, via a flexible metal cable. The steering of the car is adjusted by a lever set into the car's base, which also tilts the driver over at the correct angle for the corner. A sticker on the base reads as follows: "Important - Your Mobo Toy will always work properly if you KEEP the CABLE FREE from KINKS & BENDS". Stamped into the metal base plate is the following: "Made In England - Pats Granted & Pending - Sebel Prod. Ltd". D. Sebel & Co., who made the Mobo Toys, were located in Erith, Kent. This Mobo Toy measures 8.5" in length. The firm made a huge variety of toys, mainly in tinplate, ranging from toy cars such as this one, through fun objects such as the Mobo Rocking Snail, to various pedal cars and the perhaps their best known product, the Bronco ride-on horse. Their first toys were produced in 1947, and continued until 1972.